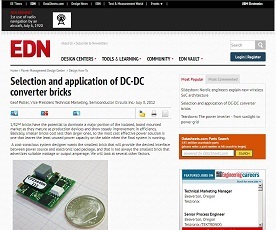 Atkinson, NH – October 10, 2018 – Semiconductor Circuits, Inc. expands the power rating of the “Cool Power Technologies” wide input range 16th brick DC-DC converter series. These open frame (through-hole or SMT) or baseplated modules provide up to 72W of output power @ output voltages of 5.0, and 12Vdc – ideal for distributed power architecture applications or as a fully regulated intermediate bus converter. These modules are compliant with DOSA 16th brick footprint and interface standards. The converters have a wide input voltage range of 18 to 72 VDC (9-36 Vin upon request) & provide 2250 VDC input to output isolation. The CPT 4:1 series offers output voltages from 3.3V to 48V and input voltage ranges of 9-36Vin or 18-72Vin. Other power levels and output voltages in the 4:1 input series are available upon request. We also welcome quick-turn modifications and custom configurations to meet our customer’s particular requirements. The CPT 4:1 input series meets EN 60950 basic insulation requirements and is RoHS 2 Directive 2011/65/EU and REACH 1907/2006 – 191 SVHC update 27 June 2018 compliant. The module complies with all of the typical industry requirements including no load operation, 2X nominal input voltage transient and pre-biased load startup. Other features include: fixed-frequency operation, auto-restart OVP, OCP & OTP protections, UVLO, remote sense and +/-10% output voltage trim using industry standard equations. Remote ON/OFF is standard with positive or negative logic options available. The modules feature a standard 16th brick pinout with dimensions of 1.3” L x 0.9” W (33.02mm x 22.86mm.) They have a maximum height of 0.374″ (9.5mm) which accommodates tight card spacing with minimal airflow blockage of downstream components. Baseplate modules offer a standard 0.500″ inch max. height [12.7mm] for interfacing with heat spreader/chassis surfaces. A product brief and technical datasheets are available at www.dcdc.com & sample quantities can be ordered directly from stock via the website. Please contact sales@dcdc.com or call 1-888-GET-DCDC (1-888-438-3232) toll free for OEM pricing and availability. 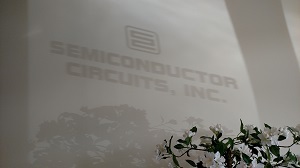 Semiconductor Circuits, Inc. has been designing and manufacturing AC/DC & DC-DC modules for over 45 years (founded in 1966.) Module applications include: industrial, test, telecom/communications, networking, data-processing, railway, military, medical and aerospace. Please visit our website at www.dcdc.com for more information.